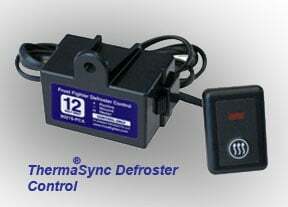 View cart “2824-M ThermaSync Defroster Control and Switch, 24 V” has been added to your cart. Defroster installation and control made easy. Can be used on mirrors and factroy defrosters! These reliable defroster controls are the perfect companion to Clear View and other defrosters including heated mirrors and ffactory rear window defrosters. All four ThermaSync defroster control models feature automatic shut off timing and a remote defroster switch with red indicator light. Pressing the defroster symbol turns the control on and activates the LED indicator lamp. The control automatically shuts off at the designated time or when the switch is pressed again. ThermaSync® defroster controls are included with all Clear View “Complete” defroster products. See the individual control brochures in the information block below. ThermaSync rear window defroster controls are available in 12 and 24 Volt. Clear View II Defrosters are also available is 12 volts and 24 volts. All ThermaSync timing controls are rated to 25 amps. The 2712/2724 controls provide simple automatic ten minute timing. These relay based defroster controls are included with complete Clear View II defrosters that use 100% power modulation. 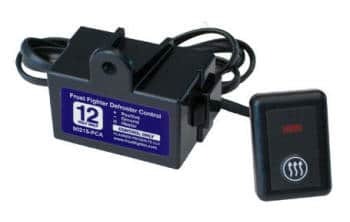 All controls include the defroster switch and connectors for easy installation. The 2812/2824 controls feature adjustable automatic off timing, power modulation and can be networked to allow multiple defrosters to be activated by a single switch. All controls include the defroster switch. 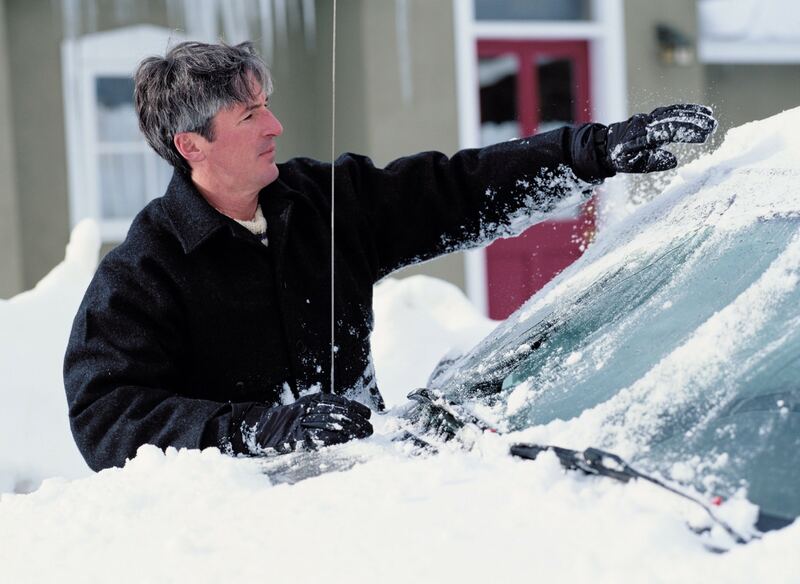 The length of time the defroster is on can be set to 10, 20, 40, 80, 160 minutes or manual off. This is ideal for plow trucks or other applications in which the defroster should be left on longer than the normal ten minutes. The ThermaSync defroster switch can be mounted up to 30 inches from the control which allows for remote installation of the switch either in dash or with the under dash in the mount supplied in the 2728 Installation Pack. See below for more on the 2728 pack. Frequently replacement windows come with a defroster but the vehicle does not have the defroster circuit needed to operate the unit. When the vehicle has a defroster but no defroster control, ThermaSync is a good choice to power OEM and factory rear window defrosters. We recommend the 2712 ThermaSync Defroster control for these applications. The 2712 ThermaSync Defroster Control when combined with the 2728 Installation Pack provides a complete solution for operating factory defrosters, defoggers and demisters. The ThermaSync defroster controls are a good companion for powering aftermarket heated mirrors independently or with Clear View defrosters. ThermaSync controls are compatible with aftermarket heated mirrors from Grote, West Coast, Sure Plus, Truck Lite, Dorman and factory heated mirrors from Ford, Chevrolet, GMC, Dodge and others. ThermaSync defroster controls are a good addition to any heated mirror installation. The 2712 ThermaSync Defroster Control is the reliable relay based defroster control which features 10 minute automatic timing. Push the button and the defroster goes off in ten minutes automatically. For most applications the 2712 ThermaSync control is a good choice. If other timing options are required the 2812 ThermaSync Defroster Control features timing that can be changed in the field. The ThermaSync 2812 is a little more complex featuring automatic timing that can be set in the field by moving small jumpers on the controls printed circuit board. ThermaSync Defroster controls are available is 12 and 24 volts. The 2812/2824 defroster controls can modulate the apparent power delivered to the defroster. These controls change the apparent voltage delivered to the defroster based on a jumper setting on the control. Power modulation allows for small defroster designs and prevents small defrosters from over heating. Modulation is set at the factory to match the requirements of the Clear View defroster it ships with. The setting of 100% delivers the full voltage from the vehicle to the defroster while 3% delivers only a fraction of that voltage. Each Clear View defroster has a specific modulation with smaller defrosters having lower modulation settings. The modulation requirement for a specific Clear View defroster is shown on the first page of Attachment 2 of the instructions. It is CRITICAL that the ThermaSync defroster control’s modulation setting match the requirements of the defroster it controls. Measuring the voltage from a modulating control is difficult as the voltage is being switched giving most multi meters erratic signals and fluctuations in the voltage display. This is normal when reading a modulating control. The ThermaSync Installation Pack makes it a snap to install ThermaSync defroster controls. 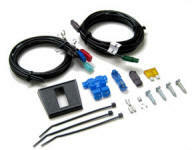 The wire harness meets the amperage demands of defrosters while the color coded connectors match ThermaSync controls. 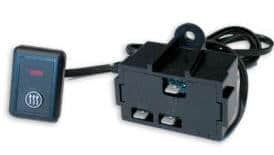 Includes switch mount, fuse, fuse holder, power tap and spare connectors. Installation Pack does NOT include ThermaSync controls. More on the ThermaSync Installation Pack. The ThermaSync Switch Boss enables a single switch to activate almost any number of Clear View II defrosters using ThermaSync controls. 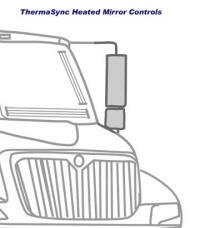 Ideal for equipment cabs, and other applications that require several defrosters to be activated by a single switch. Each Switch Boss can control up to four defrosters. Connecting a second Switch Boss allows control of up to seven Clear View defrosters from one switch. Not compatible with 2700 series ThermaSync Controls.